A 20-year veteran, Master Sgt. 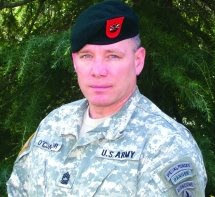 Brendan O’Connor, formerly a senior medic on a 2nd Battalion, 7th Special Forces Group (Airborne) Operational Detachment Alpha, was presented the Distinguished Service Cross for valorous actions during Operation Enduring Freedom. O’Connor was instrumental in keeping his team alive during an intense battle with more than 250 Taliban fighters in southern Afghanistan on June 22, 2006. While making a temporary stop during a patrol, his team and their attached Afghan National Army soldiers were attacked from all sides with small-arms fire, heavy machine guns, rocket-propelled grenades, recoilless rifles and mortars. During more than 17 hours of sustained combat that followed, O’Connor and his team fought off wave after wave of Taliban attackers from a group of small compounds. Much of the combat was so close that the defenders of the compounds could hear cursing and taunting from the enemies who swarmed the perimeter. After hearing two Soldiers were wounded at another location, O’Connor removed his body armor so he could press his body into a shallow ditch, then low-crawled some 200 feet under heavy machine gun fire to treat and extract his wounded comrades. One teammate commented that as he was crawling, machine gun fire “mowed the grass” around him. O’Connor then carried a wounded Soldier back to a safer area, again passing through intense fire. One Soldier with a massive leg injury died, but O’Connor was able to save Master Sgt. Matthew Binney, also a Special Forces medic, who had been shot in the head, shoulder and arm. He then helped organize the continuing defense of the compound and eventual evacuation of the team. The DSC is the second highest award for valor, surpassed only by the Medal of Honor. “I’ve never been more honored, but this medal belongs to my whole team,” said O’Connor. “Every member was watching out for the other, inspiring each other, and for some, sacrificing for each other. We all fought hard, and it could just as easily be any one of them standing up here getting it pinned on; every one of them is a hero,” he said. Four other members of the team, including Binney, received the Silver Star, the Army’s third-highest award for valor. Binney recovered from his wounds after treatment at Walter Reed and Womack Army Medical Centers, and now is a pre-medical student at the University of Arizona. Thank you for your service, Master Sgt O’Connor.